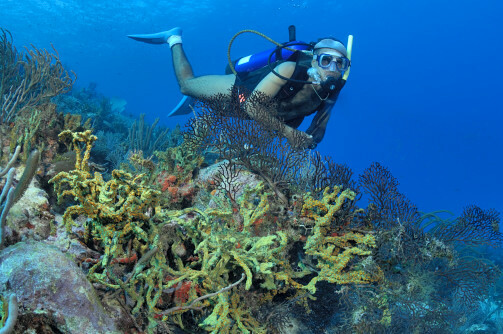 Grenadines Dive is owned and managed by Glenroy Adams. Glenroy is from a well known seafaring family of French, Scottish and Carib descent and is a true Vincention (pronounced "Vin-cent-Shun"). His father built and operated the famous Friendship Rose, a two-masted schooner that for over 20 years, carried mail, passengers and cargo up and down the islands. Glenroy carries the seafaring tradition underwater. He fell in love with diving and studied in the United States to become a NAUI instructor. Grenadines Dive is an efficient operation catering to small groups where individuals can help choose their dives. Instructors are NAUI or PADI professionals and instruction is available - from resort courses to full certification. 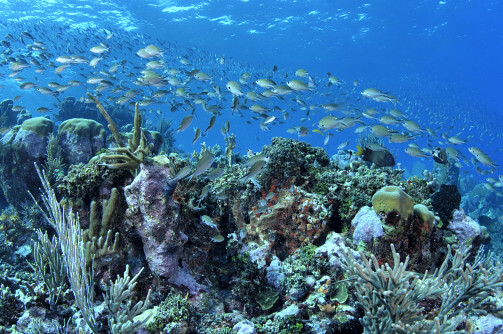 Union Island is our home base offering some nice easy dives with lots of fish and corals. We have some shallow dives and great night diving. 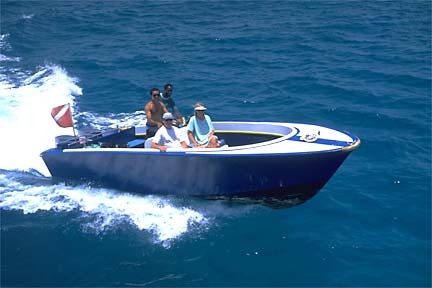 Special trips can be arranged to the other side of the island complete with a picnic lunch. This is a great dive for a resort course. It is an easy dive with lots of corals, fish, sting rays and the occasional manta ray. Depth varies from 20 to 50 feet. Great night dive. This is a drift dive where you will see turtles sting rays, moray eels. There are big boulders at 55 feet and then a gentle drop off running parallel to the land. Petit St. Vincent is a private island resort with excellent diving in the vicinity. This is a drift dive with an average depth of approximately 50 feet. This is the place to see huge lobsters, and moray eels. There are also lots of sharks including Caribbean Reef sharks and nurse sharks sleeping in the sand. This dive site has a mooring underneath the surface. You will see small lobsters and one of the biggest lobsters you have ever seen anywhere. Black and white spotted drums dance amongst the reef which gently slopes off to about 65 feet. 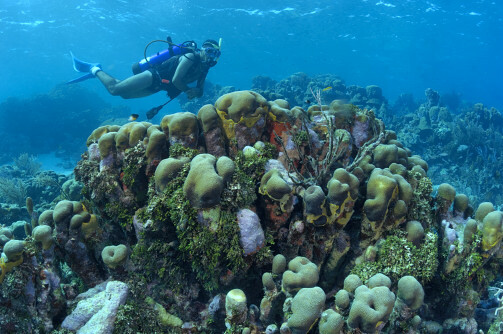 Of all the islands we dive, Mayreau has the most dive sites. Depending on the direction of the current this dive can be done to the north (55 feet deep) or to the south (80 feet deep) as a drift. This site has the best coral formations. You can see most everything here: big sea fans, schools of fish. The average depth is 90 feet. This is a 1918 English gun ship approximately 140 feet in length and found in only 40 feet of water. Great wreck dive for beginners as well as advanced divers. This is an underwater volcano with continues bubbles. The water temperature here changes dramatically, becoming very warm. There is an abundance of outstanding corals. This area is made up of five uninhabited keys and is a National Park, protected by the government. 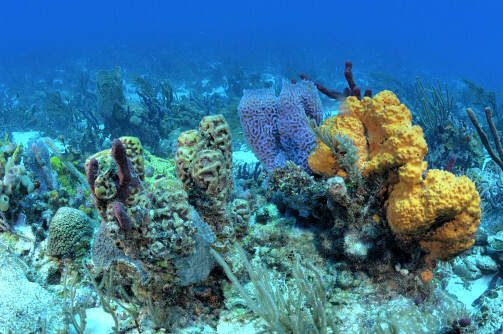 At 60 feet you will find numerous soft and hard corals. There are sand sharks and nurse sharks sleeping under ledges. At 70 feet you will find sting rays sleeping in the sand. This is also the place to see squadrons of spotted eagle rays swimming in formation. This is a great dive for a resort course. Maximum depth is 45 feet. This is the ultimate dream dive that every diver wants to see. Because of its exposed location, this dive is limited to good weather conditions. This is a pinnacle dive complete with a cave which has 2-3 separate exits, schools of fish, stingrays and an old cannon. There are strong currents because the area is very exposed and weather dependent. Depth is approximately 70 feet and the experience is out of this world. Advanced divers only.